IHG is partnering with Baidu, a Chinese technology solution provider, to introduce its next generation of intelligent hospitality at properties that include the InterContinental Beijing Sanlitun and InterContinental Guangzhou Exhibition Centre. As voice activated and text-based devices utilizing artificial intelligence (AI) prove out their value in hotel settings in ways that would have been all but unimaginable only a few years ago, they are assuming a greater share of responsibilities. This is particularly true in the area of hotel guest services. By being able to respond to guest inquiries far faster than their mere mortal service rep counterparts — and by being able to field any number of inquiries simultaneously, with virtually no capacity constraints — the devices are shortening guest wait times in very significant ways while providing immediate access to information and services. Faster service response time and faster problem resolution time are, of course, top drivers of overall guest satisfaction. Having the ability to improve guest satisfaction by even a few percentage points may be reason enough for any hotelier to embrace the promise of AI-enabled guest response systems. More than a promise, artificial intelligence has been shown to dramatically reduce the need for human assistance when it comes to answering questions (owing to a vast repository of information, both internal and external, at their digital fingertips) and resolving problems that commonly arise during a guest stay. Several leading hotel groups report that their AI-enabled concierge services, answering guest queries by text and/or voice, have reduced calls to the human concierge desk by 35 percent or more, freeing associates on property from routine tasks. According to research conducted for this study, an average of 70 percent of guest requests are now handled automatically by AI-enabled response technology in hotels where the systems have been implemented. The results in terms of time savings, cost savings and guest relationship enhancement make for a strong business case for investing in hotel technologies that harness the power of artificial intelligence. Now Intercontinental Hotels Group (IHG), which ranks as one of the world’s largest hotel companies, has rolled out new artificial intelligence (AI) powered “smart rooms” at its properties in China. The stated goal, however lofty, is to improve and redefine customer hotel experience in China’s hospitality industry. IHG is partnering with Baidu, a Chinese technology solution provider, to introduce its next generation of intelligent hospitality at properties that include the InterContinental Beijing Sanlitun and InterContinental Guangzhou Exhibition Centre. 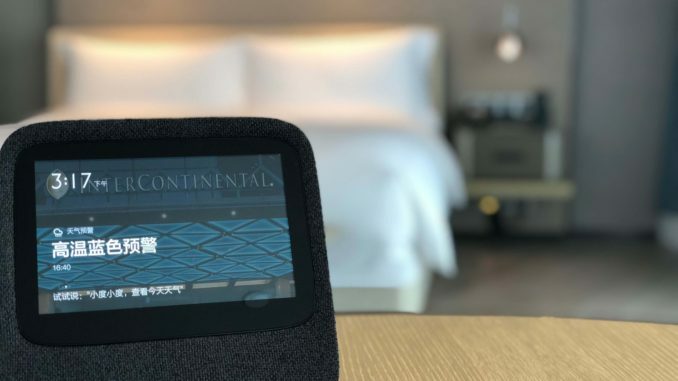 The hotel group reports that a total of 100 AI powered Club InterContinental suites will be available at InterContinental hotels in gateway cities and key destinations across China before the end of the year. The Baidu DuerOS platform integrates AI-enabled technology with hotel operations customised for InterContinental Hotels & Resorts. The AI smart room technology will fully embrace voice control technology to deliver a more natural human-computer interactive experience. For instance, guests will be able to freely switch settings between work and leisure modes, and enjoy a more convenient and seamless room service experience. This solution will also further fine-tune the current backstage management system, including customizing information and resetting devices. IHG and Baidu signed a strategic partnership on AI development last November.